C-FXRI at Otter Lake, Missinipe, Saskatchewan. Aircraft shipped to Australia Apr-15-1958. Delivered to de Havilland Australia at Bankstown May-1958. • VH-EAZ. Qantas Empire Airways Ltd. Registered 21-Aug-1958. Based at Lae, PNG. Operated as a landplane. • VH-SBT Trans Australia Airlines (TAA), from 01-Sep-1960. Continued in PNG. • VH-SBT Registered to Australian National Airlines Commission, 08-Dec-1960. • VH-SBT Sold to Hawker de Havilland, Bankstown, NSW. Date unknown. • VH-SBT (or un regd) Bannock Aerospace Ltd., of Toronto, ON. Purchased Jun-1968. Regn canx 28-Aug-1968. Note: Commenced ferry flight from Sydney (Bankstown) to Vancouver, BC on 17-Aug-1968. • CF-XRI Air West Airlines of Vancouver, BC. Purchased 08-Aug-1968. Regd 27-Aug-1968. Accident. Campbell River, BC. 04-Feb-1981. The Otter struck a submerged rock during take-off and punctured the starboard float. • C-FXRI Absorbed into Air BC Ltd., Richmond BC. Dec-1980. Canx 25-Nov-1982. • C-FXRI Coval Air Ltd., Campbell River, BC. Canx 30-Apr-1986. • C-FXRI Osprey Wings Ltd., La Ronge, SK. Based Missinipi, SK. Regd 22-Apr-1987 & 14-Sep-1987. Power plant: Converted to Vazar turbine by T C Aviation, Saskatoon, SK. Otter Lake. Otter 258 was delivered to Qantas Empire Airways Ltd., on 16 April 1958 registered VH-EAZ. It was one of four Otters delivered to the Australian national carrier for services in the Territory of Papua New Guinea (PNG). The Otter was shipped to Australia in a crate, where it arrived at the Hawker Pacific facility at Bankstown Airfield, Sydney in May 1958. It was re-assembled and officially registered on 21 August 1958. It then joined the Qantas fleet named “Kerowagi”. It was one of three Otters landplanes based at Lae and operated services in the Highlands. With effect from 1 September 1960 the four Qantas otters were transferred to Trans Australia Airlines (TAA) and re-registered. VH-EAZ became VH-SBT with TAA on 8 December 1960 and retained the name “Kerowagi”. It was painted into full TAA colour scheme with “Sunbird Services” along the cheatline. It featured a white disc on the tail with a multi-coloured stylised hummingbird. 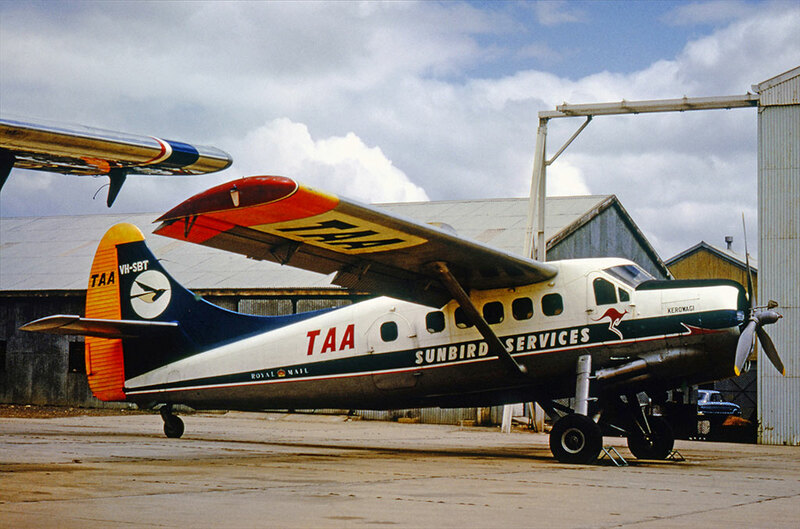 VH-SBT continued in service on TAA’s “Sunbird” services within PNG until 1 November 1966 when it was ferried from Lae to Bankstown, where it was joined by VH-SBR (247). Both Otters were put into storage awaiting sale. They were traded in to Hawker DeHavilland against new DHC-6 Twin Otters and in turn sold on by Hawker de Havilland to Bannock Aerospace Ltd., of Toronto, Ontario. VH-SBT was noted in storage at Parafield Airport, Adelaide in late 1967 with all markings removed. It was sold by Bannock Aerospace to Air West Airlines of Vancouver on 13 August 1968, having at that stage 6,109 hours on the airframe. Marks CF-XRI were allocated and it commenced the long ferry flight to Vancouver on 17 September 1968, island hopping across the Pacific. XRI after arrival in Vancouver was painted into Air West’s colour scheme of white fuselage with orange and red cheatline and company titles and entered service on floats, flying from Vancouver Harbour. It flew on the company’s scheduled services to Vancouver Island, alongside Air West’s fleet of Beavers and Twin Otters. Air West Airlines merged into Air BC, to whom the Otter was registered in December 1980 and it was repainted into full Air BC colour scheme and continued with the scheduled services from Vancouver. A minor incident was recorded on 4 February 1981 at Campbell River when the Otter struck a submerged rock during take off and punctured the starboard float, which was repaired. When it became clear that Air BC’s attempt to merge the many floatplane operators it had acquired on the Pacific coast into a unified airline was not going to work, the process was reversed and they were sold off. One of the companies to take over was CoVal Air, which acquired Air BC’s Campbell River base on Vancouver Island. The registration of C-FXRI to Air BC was cancelled on 25 November 1982 and it went on lease to and was subsequently purchased by CoVal Air. The Air BC colour scheme was retained but the tail was painted all red and CoVal Air titles added. It flew alongside CoVal Air’s other Otters from the Campbell River base, until the registration of XRI to CoVal Air was cancelled on 12 November 1985 and it was put into storage at Campbell River with titles removed. It was flown to Vancouver on 30 April 1986 and put into storage there and put up for sale. The buyer of the Otter was Nipawin Air Services Ltd., of Missinipe, Saskatchewan, which at the time of the purchase was in the process of changing its name to Osprey Wings Ltd. Having served on the Pacific coast for many years, it was time for Otter XRI to move east. It was flown to Saskatoon and registered to Osprey Wings Ltd., on 22 April 1987. At Saskatoon it was converted with the PT-6 engine to a Vazar turbine Otter by T.C.Aviation. It was painted into its new owners white and red colours with Osprey Wings titles and entered service, based at the appropriately named Otter Lake at Missinipe. It was joined by other turbine Otters and the company also flies Twin Otters, Beavers and Cessna 185s. Osprey Wings provides charter service throughout northern Saskatchewan for fishing lodges, private cabins, canoeists and tourists and also supports exploration activity. When Points North Air ceased operations, Osprey Wings established a base at Points North Landing and took over much of the business which Points North had, supplying remote settlements in the region. The turbine Otters fly year round, on floats in summer and wheel skis in winter from the Otter Lake and Points North Landing bases. As at summer 2017 XRI continued in service with Osprey Wings, thirty years after it had been acquired by the company.